forum.419eater.com :: View topic - Angry rock. Back in the day, I used to climb a bit. Mostly for sport and fun. But this is one mean looking rock. The face like apparitions it sports are quite foreboding. Northern Yosemite Nat'l Park. It's called the "Doodad". What a fine perch for a mugu to spend the winter! Impressive - but it's difficult to get a sense of scale. Do you have any measurements? Almost looks like a little extra weight up the top would be enough for it to topple over. Thanks Shiv. Tis a tricky crux of a granite monolith. Once you're at the top, how the $^&%@# do you get back down? Shiver - taking a dump on the summit is not what I meant by adding "a little extra weight". No, never climbed the Doodad. Been up a few other peaks in the Sierra Nevada though. Exit is via rappel. Just thought the pic was cool. It's in some old stompin' grounds. I have my own personal Doodad, but nobody is interested it it anymore. (Whoops, Chase beat me to the exit strategy)! Rappelling, would that be anything like Abseiling by any chance? PS - What's the grading on that pitch? Same verbage, rappel, abseil. I could be wrong, but I believe the easy pitch on the rock is 5.6. (Looks harder,doesn't it)? 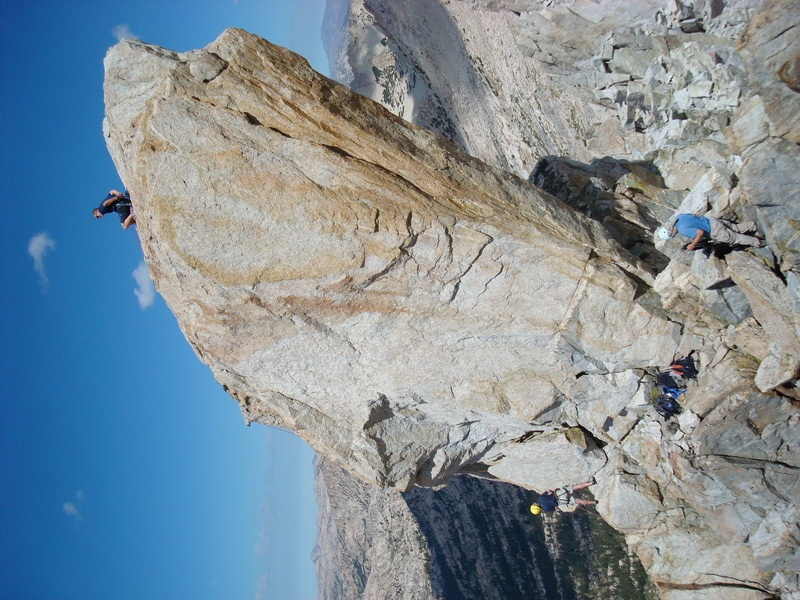 There's a rock near Tahoe with a 5.13 c or d, if you like to hang upsidedown for 15 minutes on flakes the size of salt grains. Sugarloaf is the sweet name of that granite dome. 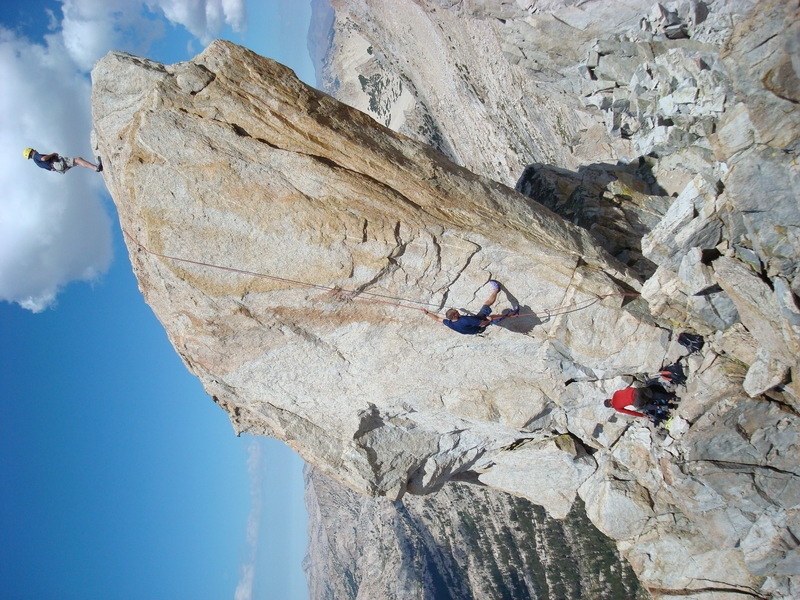 As an example, Here's Dan Osman doing a 5.7, unroped, on Bear's Reach, across from Sugarloaf. This will make your socks smoke. You might have to click the You Tube link. Unfortunately, he died in a Yosemite accident on a static jump. You have got to be f*cking kidding me, that is time lapse right!!! That Dan Osman is insane. What is he half monkey ? ^^ now I know why he can run so fast. I see he is trying to put his hand into any crack he can. Maybe the hill just needed a little crack scratch. If you liked Dan Osman free soloing Bear's Reach, I invite you to check out Mr. Potter on the Nose route of El Capitan in Yosemite Valley. Gussie should like this one. (I love the look on the one climbers face he runs by)! Free solo speed records and first ascents on a few routes. And if free soloing the Nose isn't enough try this on for size. WOW. Highline walk to Lost Arrow. WOW! If anyone needs a scale comparison, these walls are over a half a mile high. So, don't loose your grip. A bit more of Dan Osman.